Suri alpaca cross. I could not resist these when they came into the Guild with a local grower. I dyed them… and carding was quite a challenge. Some went to a friend at the Guild who showed up with wheel but no fibre one night when I was there with fibre and combs and carder but no wheel! I also dyed some local gift sheep fleece from a sheep called ‘Lentil’. I had been taken in by Lentil’s lowly status as a lawnmower and the filth of the fleece. Actually, Lentil’s is a long and lustrous fleece with a burden of burrs. 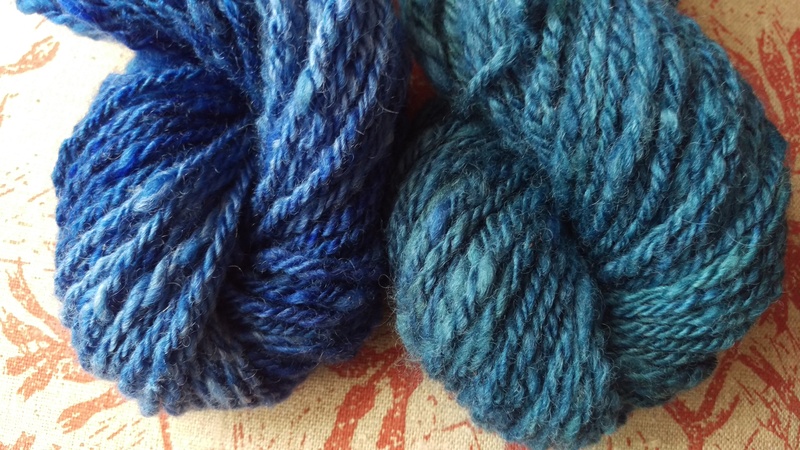 And perhaps they are destined to become slippers–because I am trying to spin for the things I knit this year. Really, I knit slippers and socks. So. Here we go! 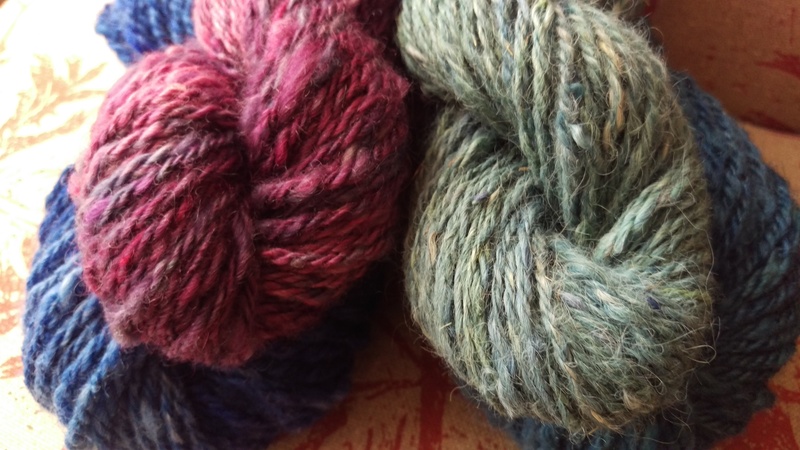 Lentil in berry colours on the left, and suri cross in pale greens on the right. Luscious!! What a satisfying process it must be to see the raw wool transformed and ready for all your projects. The locks, your carded fleeces and the yarn it all looks beautyful and motivas me to wash some fibers (weather will be fine next days). Previcely because just 20 minutes ago the sheepshearer was here. Wow! How exciting to have fresh fleece from your own sheep to spin! I hope you enjoy every moment. Knowing that your yarn/slippers/socks came from Lentil the lawnmower…priceless. 0.3 degrees in Canberra this morning. Definitely slipper weather. I love that, Lentil the Lawnmower 🙂 Good job with that Suri…NOT a favourite of mine but maybe the ‘cross’ part saved it ! Great colours for Happy Feet!! Thanks! I have told the sheep keeper that Lentil is now Lentil the Lawnmower. He had a great laugh!